The Militant spent most of his Monday in North Hollywood, visiting an unspecified operative about a mile from the (M) Red Line terminus, which he took along with his bike. After the operative he decided to embark on a bike ride around the place for the next nine or so miles. Though it was the middle of Summer, it was uncharacteristically warm (as opposed to freaking SFV hot), and by the time the Militant left the operative's house at around 6 p.m., he was more struggling to feel the warmth of the Sun's rays rather than submitting to them (remember, the Militant is solar-powered, after all). He rode west on Burbank, then up the Lankershim diagonal (which is in serious need of a re-paving, at least from a cyclist's perspective) until Victory, then followed the Sun west to Coldwater Canyon, where he went shopping at an unspecified store. Heading south on ColCan, in what may or may not be North Hollywood (technically Valley Glen, though isn't that kinda redundant?) he happened upon the Tujunga Wash, one of the Los Angeles River's major tributaries. You may or may not know that the westernmost wall of the Tujunga Wash is adorned with one of the longest (at 2,754 feet) murals in the world - The Great Wall of Los Angeles (pictured above). Created in the mid-late 1970s by Venice-based community arts nonprofit SPARC (the Militant rode by their arts center on a Westside ride a couple years ago), the mural details Los Angeles history from 20,000 B.C. to 1984 (though everything from the 60s to '84 has been abruptly summarized). Most of the wall depicts the achievements and struggles of our ethnic and immigrant communities during the 20th century. The mural will be undergoing a three-year renovation which will also include a more detailed update of local history from the '60s to today. Interesting thing, as the Militant crossed Burbank Blvd on his bike, he couldn't help but notice the cars making a left turn westbound from Coldwater Canyon seemed noticeably less courteous and considerate to this cyclist than other parts of the City. Hmmm. So there you go, Westsiders, Eastsiders and Centralists - you all treat cyclists much better than them Valley folk! After evading being mowed down by SUVs, the Militant continued on his way south and headed due east on Chandler, with the whirr of silver-colored Orange Line buses passing him every few minutes. Returning back to Lankershim, the question went before him: Head back to the compound now on the subway, or bike down to Universal City? The latter won out, of course. But not before noticing a little something in the NoHo Commons building: A memorial (pictured right) to LAFD firefighter Thomas G. Taylor, who died in the line of duty while fighting an arson fire on this location (then Cugee's Restaurant) in January, 1981. People put their lives out on the line in this City. Recognize. "OH ON" - But with the "N" reversed - Must be some Russian thing. The Militant wasn't aware the Russian community in North Hollywood was that big. Ohhhhhhhhh...it says, "NO HO." Duh. This must be the infamous No Ho Gateway, erected a year ago (No, this wasn't the first time the Militant saw it, but let's just pretend that it was). What does the Militant think? It's...interesting. But in all seriousness, it is art, and one of art's responsibilities is to provoke, and that it does. Besides, the locals hated this thing in Paris when it first got built, and much more recently and closer to home, a lot of Angelenos initially weren't so hot on this thing, either. But both are now icons. So if history is an indicator, eventually, people will tolerate and eventually accept the thing, just you watch. Failing to find a suitable sammich shop, the Militant settled for Pita Fresh on Lankershim, where he found him a-good-but-not-awesome (because there's better pita joints in the areas not too far from the Militant's compound) chicken kebab pita plus a drink for $7. Funny thing, most of the people at Pita Fresh were not chomping down falafels, but visiting Facebook on their laptops (they do have free Wi-Fi though). Soon after the Militant and his bike descended the elevator taking him deep below the ground at Universal City where he boarded the southbound Red Line train and spotted a dude in his car who looked a lot like Sam Hall Kaplan. But like any other people who may or may not be recognizable figures, the Militant just dismisses the person as some random dude who just happens to resemble the local writer and reporter. Commandeered by Militant Angeleno @ 11:47 PM 4 comments: Hyperlinks, yo! 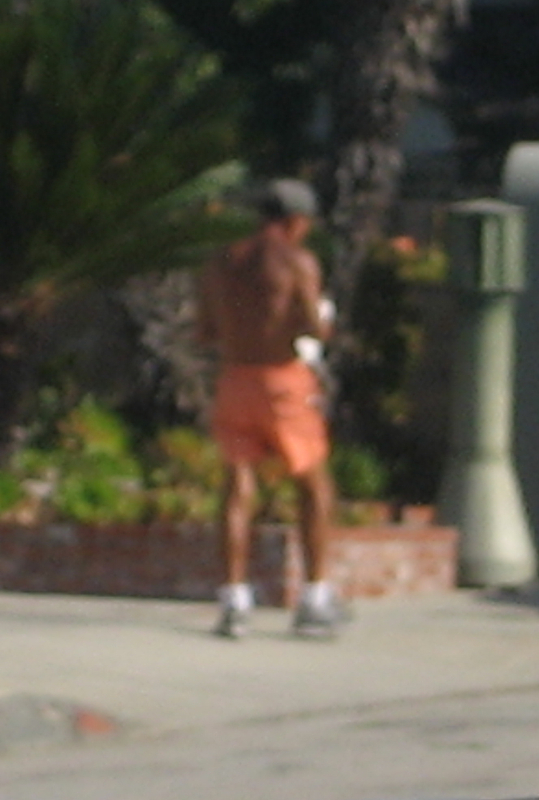 Like many Angelenos and the rest of the bloggerverse, the Militant pays his respects to Dr. Marc Abrams, the shirtless, sunburnt newspaper-reading pedestrian known by many for his 15-mile walks around the Silver Lake area, who died on Thursday. 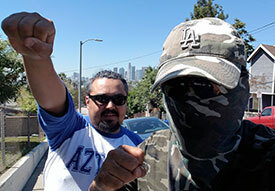 The Militant, like many, was fortunate to see him roam Silver Lake, and has passed him many times on his bike, especially on the Griffith Park Blvd. bike lane. But he is most honored to see him walk outside of his element, where an early MA blog post (so early, the Militant still referred to himself the first person) mentions Dr. Abrams walking, of all places, in the Venice boardwalk one fine day in June 2007. It's an understatement to say he'll be missed. He's a modern-day folk hero. Maybe his saga will live on in tall tales and join the likes of Paul Bunyan or Chuck Norris. At least we know he's walking in an even better place. Now, most have been puzzled as to why a physically fit quinquagenarian physician met an early demise. The Militant is no doctor, nor does he play one on TV, but he may or may not have an reasonable explanation. Walking has many health benefits, that cannot be denied. The Militant may not walk 15 miles a day but walks an awful lot compared to his more rotund, sedentary, suburban-based operatives. Walking definitely lowers one's blood pressure. The Militant, who, on one of his parents' sides has a history of high blood pressure, received a "very normal" blood pressure reading in his last physical exam. Dr. Abrams, who died while sitting in his backyard hot tub, might have spent too long in there, as hot water causes one's blood vessels to dilate and lowers blood pressure even more. Coupled with the fact that, according to a 2009 LA Weekly interview, he lived off of a junk food diet and three hours of sleep each night. He might have also been suffering from a congenital heart condition. The Militant's one-time freelance "boss," a man known for jogging every day, succumbed to heart failure himself in November 2007. There will inevitably be tributes and memorials to Silver Lake's folk hero, such as Sunday's memorial walk at noon. The Militant may or may not be there! There's even a move to rename the Silver Lake reservoir path after Dr. Abrams. Councilman Eric Garcetti was even approached on the renaming. Honestly, though the Militant strongly feels he is worthy of some sort of formal memorial or tribute, the move, though earnest, ignores recent history, and the reason why there's a path around the reservoir. For those of you new to Silver Lake, prior to the last decade, there was no path around the Silver Lake reservoir. A simple painted line - and mostly faded at that - delineated the space between cars and pedestrians around the lake. In June 1995, longtime Silver Lake residents Michael and Diane Manahan took a walk around the reservoir after dinner one evening when a car swerved out of control and struck them. Michael Manahan was injured; his wife Diane was killed. The accident was later discovered to be caused by a drunk driver, whom upon learning about what happened, committed suicide. Immediately after the tragedy, the office of then-councilwoman Jackie Goldberg looked into ways to increase safety for walkers and joggers around the reservoir. In 1996 the City approved the jogging path we see today, which was completed several years later. The Militant would like to see Dr. Marc Abrams honored with possibly a statue, or even an annual walk-a-thon type event. But the path deserves to be named after Diane Manahan - the person whose tragic death brought on the creation of the reservoir path - to ensure no one (Dr. Abrams included) - meets a similar fate. Commandeered by Militant Angeleno @ 5:01 PM 6 comments: Hyperlinks, yo! Today, July 14, is a special day in Los Angeles (and not just for those French expats out there). For it was 20 years ago on this date, on a hot, sunny Saturday in a then-desolate section of Downtown Los Angeles that a couple thousand Angelenos converged on Flower Street to witness the Grand Opening ceremony of the Metro Blue Line, the first component of what we now know as the Los Angeles Metro Rail system, heralding the long-overdue return of rail transit to the region. This was also listed as KCET.org's Video Of The Day! For all you longtime Angelenos, you can spot some well-known dignitaries of the time who are no longer with us, such as the late County supervisor Kenneth Hahn, California Lt. Governor Leo McCarthy and of course the great Los Angeles mayor Tom Bradley. Look closely and you can also spot City Councilman Mike Woo, RTD director Nick Patsaouras and a brown-haired James Hahn, who was City Attorney at the time. Yes, aside from being in the Pre-Villaraigosa world, we were really living in a different place back then; On Blue Line opening day, the line was only 19.5 miles long - only the section between the Pico and Anaheim stations was in operation (The Long Beach loop would open in September '90 and the underground section to 7th/Metro Center opened in Feb '91). The fares were free for the first two weeks, and afterward were only $1.10 (A 40-cent increase in 20 years? Compare that to the increase of gas prices since then - $1.16/gal vs. $3.07/gal today. Not bad when you think about it, so quit yer bitching, BRU drones). The area around Pico Station was a bleak industrial zone. No Staples Center, the Convention Center had not been expanded yet, and certainly no condos, restaurants or LA Live. In fact, tell someone 20 years ago about that and you'd get laughed at! But transit has come a long way since then. "Metro" was just a branding term back then, as the transit authority at the time was the Southern California Rapid Transit District (a.k.a. RTD (Rough, Tough and Dirty, Really Tardy Drivers, etc)). The transit planning agency was the Los Angeles County Transportation Commission, an entity invisible to the typical Angeleno. The two agencies would merge three years later to become the Metropolitan Transportation Authority, or Metro, that we know today. The blue striping on the trains were replaced several years ago with the orange striping we see today, and some of the shiny, new Japanese-built railcars that first rolled on that day will be retired and replaced in the near future (with former Gold Line cars). But most of all, the 0 miles of rail transit that existed 20 years and one day ago has bloomed into a now a 79.1-mile system of five colored lines, larger than SF's 72-mile BART system was 20 years ago. The litany of localities listed in Supervisor Ed Edelman's speech are all reachable destinations today (Well, okay, LAX...not quite yet). Most of all, the little kids and crying babies who rode on the same train as the Militant that day are now grown adults, some of whom ride Metro Rail to and from work every day. So there you go. The Militant was definitely there to witness history and bring it to you today. If you can get a chance, take a ride on Metro Rail today and reflect on where we've been and where we're going (Culver City, Santa Monica and Azusa are just around the corner). Commandeered by Militant Angeleno @ 12:12 PM 11 comments: Hyperlinks, yo! When the Militant first heard that the 2010 Lotus Festival was a go (first reported on this here blog back in March), he was excited to hear that one of his favorite City festivals made its return from its 2009 hiatus due to That City Budget Thing. • This was the 32nd Lotus Festival to take place, although the inaugural festival took place in 1972, which means there were no festivals for six years (1978, 1979, 1986, 1987, 1988 and 2009) during that 38-year history. • This was the second Lotus Festival where there was an total absence of the eponymous aquatic flora in Echo Park Lake (pictured above). • This was the first Lotus Festival to be organized independently from the City of Los Angeles Department of Recreation and Parks, this time organized by the nonprofit LA Lotus Festival, Inc., based in nearby Historic Filipinotown. • This was the first Lotus Fest in the Food Truck Era; The Lee's Philly truck was parked inside the food vendor plaza, while The Manila Machine Filipino truck was parked in the lake's vicinity. • This was also the first Lotus Festival where it rained. You heard right. Rained. At about 5:30 p.m. on Saturday, the normally-hot, sunny Lotus Fest weather on that day was a cloud-covered, humid atmosphere, and drops of rain (no metaphor here, it's the drops-of-water-falling-from-the-sky kind) fell down for about 15 minutes. So let this go down in history: 2010 was The Year It Rained On The Lotus Festival. Though the Festival was back, the looming shadow of That City Budget Thing was plainly visible everywhere. There were no Dragon Boat Races (a traditional aquatic competition held on the lake pitting City departments, offices of elected officials, nonprofit groups and local businesses against each other) and most unfortunate of all, there was no Saturday night fireworks display (So if you missed your July 4 pyrotechnics last weekend, you're S.O.L. this time around). Efforts by the Militant to confirm the fireworks yielded ambiguous answers, though it should have been obvious when he discovered that the Yoki Daiko taiko drum ensemble was not booked as the finale act on Saturday evening. But despite the Lotus-Fest-On-A-Budget this year, it was a real Lotus Festival, the same one that celebrated Asian/Pacific Islander Cultures (this year, China was the featured culture) and not the surrogate Echo Park Community Festival, which, judging from its entertainment, was more of a celebration of the newly-established gentro culture in EP. Still, none of that was able to stop the Militant from having a good time, hanging out with operatives, enjoying great music and dance performances and getting all freaked out when the rain came, all in the company of several thousand fellow Angelenos (though attendance was markedly down from 2008 - as evidenced by the very short food lines in the booths). 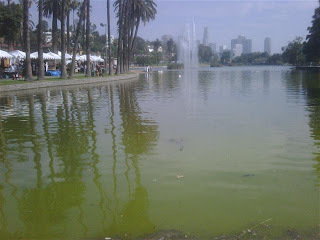 As you may or may not know, starting next year, Echo Park Lake will undergo a two- to four-year , $84 million renovation process, which will result in the draining of the lake (which was originally a natural lake, having been fed by a nearby underground spring) and closing of the park. The intention is to improve water quality, which will ultimately mean the re-planting of the lotus bed, once the largest outside of Asia. But this also means next year's Lotus Festival may or may not still happen. According to LA Lotus Festival, Inc. organizers, they are currently looking into temporarily moving the 2011 (and later) Lotus Festival(s) to another location, such as Lincoln Park or nearby MacArthur Park. Hmm...A Lotus Festival in The Real Eastside? Or Go Metro Rail To The Lotus Festival in Macarther Park? What would you prefer? Stay tuned, Angelenos! Commandeered by Militant Angeleno @ 3:37 AM 1 comment: Hyperlinks, yo! Commandeered by Militant Angeleno @ 3:38 AM 4 comments: Hyperlinks, yo! The Militant checked out the Downtown ArtWalk on Thursday night, not so much for the art, but to mainly to vibe off the street energy, sample the foodtruckage and assist an operative who may or may not be performing at the ArtWalk next month. The foodtruckage was corralled off the streets and into a parking lot on Main Street between 3rd and 4th, but upon wandering the southern edge of the lot, he discovered a curious change in topography. The ground sunk some 30 feet or so, revealing a concreted plaza with patches of greenspace, planted young palms and amphitheater stairs. There were about half a dozen food trucks, including the Fresh Fries truck, which the Militant tried out, and over a hundred folks just hanging out while a band of relatively inexperienced musicians attempt to play blues music. But crappy musical performances aside, this was totally unreal for the Militant, especially in Downtown where the elevation is flat and the pavement you walk on has been there for years. But most of all it was a crowd of people - gasp - hanging out and - gasp - using public space! Like whoa! About time! Well, it's not exactly public space. It's more publicly-accessible private space, as part of The Medallion (props to a special downtown operative for the building ID) fru-fru nouveau apartments recently erected on 4th and Main. The 96 units and 200 shops have yet to be occupied, but this plaza definitely was. But at least this is some new publicly-accessible hangout space in Downtown, that doesn't involve tons of dizzying HD video screens surrounding you for a change. Too bad we don't have a lot of real public space in DTLA (although they're working on it supposedly), but hopefully this is the shape of things to come. Commandeered by Militant Angeleno @ 1:58 AM No comments: Hyperlinks, yo!